John Bennett's biography can be found at the end of this entry. 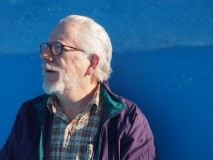 John M. Bennett has published over 400 books and chapbooks of poetry and other materials. Among the most recent are rOlling COMBers (Potes & Poets Press); MAILER LEAVES HAM (Pantograph Press); LOOSE WATCH (Invisible Press); CHAC PROSTIBULARIO (with Ivan Arguelles; Pavement Saw Press); THE PEEL (Anabasis Press); GLUE (xPress(ed)); LAP GUN CUT (with F. A. Nettelbeck; Luna Bisonte Prods); INSTRUCTION BOOK (Luna Bisonte Prods); la M al (Blue Lion Books); CANTAR DEL HUFF (Luna Bisonte Prods); SOUND DIRT (with Jim Leftwich; Luna Bisonte Prods); BACKWORDS (Blue Lion Books); NOS (Redfox Press); D RAIN B LOOM (with Scott Helmes; xPress(ed)); CHANGDENTS (Offerta Speciale); L ENTES (Blue Lion Books); NOS (Redfoxpress); SPITTING DDREAMS (Blue Lion Books); ONDA (with Tom Cassidy; Luna Bisonte Prods); 30 DIALOGOS SONOROS (with Martín Gubbins; Luna Bisonte Prods); BANGING THE STONE (WITH Jim Leftwich; Luna Bisonte Prods); FASTER NIH (Luna Bisonte Prods); RREVES (Editions du Silence); NEOLIPIC (Argotist); LAS CABEZAS MAYAS/MAYA HEADS (Luna Bisonte Prods); BALAM MALAB (Logan Elm Press); LA VISTA GANCHA (Luna Bisonte Prods); THE SOCK SACK/UNFINISHED FICTIONS/MORE INSERTS (with Richard Kostelanetz; Luna Bisonte Prods); T ICK TICK TIC K (Chalked Editions and White Sky Books); THIS IS VISUAL POETRY (This is Visual Poetry); EL HUMO LETRADO: POESÍA EN ESPAÑOL (Chalk Editions; 2nd ed. White Sky Books); ZABOD (Tonerworks); TEXTIS GLOBBOLALICUS (3 vols. ; mOnocle-Lash Anti-Press); NITLATOA (Luna Bisonte Prods); OHIO GRIMES AND MISTED MEANIES (with Ben Bennett, Bob Marsh, Jack Wright; Edgetone Records); SUMO MI TOSIS (White Sky Books); CORRESPONDENCE 1979-1983 (with Davi Det Hompson; Luna Bisonte Prods); THE GNAT’S WINDOW (Luna Bisonte Prods); DRILLING FOR SUIT MYSTERY (with Matthew T. Stolte; Luna Bisonte Prods); OBJECT OBJET (with Nicolas Carras; Luna Bisonte Prods); CARAARAC & EL TÍTULO INVISIBLE (Luna Bisonte Prods); LIBER X (Luna Bisonte Prods); CUITLACOCHTLI (Xexoxial Editions); BLOCK (Luna Bisonte Prods); THE STICKY SUIT WHIRS (Luna Bisonte Prods); PICO MOJADO (with Byron Smith; Luna Bisonte Prods); SOLE DADAS & PRIME SWAY (Luna Bisonte Prods); OLVIDOS (Luna Bisonte Prods); SACARON NAVAJAS (Redfoxpress); AREÑAL (with Luis Bravo; Yaugurú); LA CHAIR DU CENOTE (Fidel Anthelme X); THE LUNCH THE GRAVEL (X-Ray Book Co.); BRAVÍSIMA RESEÑA (with Diana Magallón; Luna Bisonte Prods); TURNS IN A CLOUD (White Sky Books); YES IT IS (with Sheila E. Murphy; Luna Bisonte Prods); DE LA MEMORIA EL PEZ (with Lola López-Cózar; Luna Bisonte Prods); AMINIMA (with Richard Kostelanetz, Archae Editions); and MIRRORS MÁSCARAS (Luna Bisonte Prods) . He has published, exhibited and performed his word art worldwide in thousands of publications and venues. He was editor and publisher of LOST AND FOUND TIMES (1975-2005), and is Curator of the Avant Writing Collection at The Ohio State University Libraries. Richard Kostelanetz has called him “the seminal American poet of my generation”. His work, publications, and papers are collected in several major institutions, including Washington University (St. Louis), SUNY Buffalo, The Ohio State University, The Museum of Modern Art, and other major libraries. His PhD (UCLA 1970) is in Latin American Literature.